Iron is an essential micronutrient for plant. As the cofactor of many enzymes, it plays an important role inphotosynthesis, respiration and other metabolisms. The Prof. LING Hongqing’s team at the Institute of Genetics and Developmental Biology, Chinese Academy of Sciences, identified four novel interactors involved in iron uptake regulation network and revealed the related molecular regulation mechanism. Although abundant in soil, iron deficiency is one of the most common nutrient deficiencies in the world due to its low bioavailability in alkaline soil, which accounts for approximately one-third of the world’s soils. Under iron-limited stress, plants display chlorosis in young leaves and inhibition of plant growth and development. To cope with the iron deficiency, plants develop two distinct strategies (strategy I and strategy II) to acquire iron from soil. All dicots and nongraminaceous plants apply the strategy I mechanism, also called reduction mechanism. Under iron deficiency, strategy I plants, such as Arabidopsis, secrete proton from roots to soil to acidify rhizosphere for improving the solubility of Fe3+. Then, Fe3+ is reduced to Fe2+ on root surface via ferric reductase-oxidase 2 (FRO2), and the Fe2+ is subsequently transported into root cells through iron-regulated transporter 1 (IRT1). Graminaceous plants use the strategy II mechanism, which is also called as chelation mechanism. For dealing with iron deficiency, the strategy II plants synthesize abundant phytosiderophores (PS), such as mugineic acid, and secrete PS to soil to chelate Fe3+ and form Fe3+-PS complexes, which are acquired into root cells via the transporter YELLOW STRIPE 1 (YS1). Additionally, excessive iron induces hydroxyl radical formation and damages cellular constituents, such as DNA and lipids. Therefore, the uptake, translocation and internal distribution of iron are tightly controlled in plant. In Arabidopsis, FIT is the key regulator of iron uptake regulation, which encode a bHLH transcription factor. FIT interacts with bHLH38, bHLH39, bHLH100, and bHLH101 (Ib subgroup bHLH proteins) to form heterodimers to activate the expression ofiron uptake genes, such as IRT1 and FRO2. Jasmonic acid (JA), as a negative regulator of iron uptake, inhibits the expression of IRT1 and FRO2. However, the molecular mechanism is unknown. The Prof. LING Hongqing’s team identified four novel interactors of FIT, bHLH18, bHLH19, bHLH20 and bHLH25, by yeast-two hybridization. Their expression was mainly in roots and induced by JA. They proved that the four transcription factors were the negative regulators of FIT. They facilitated the degradation of FIT via 26S protease via dimerization-driven degradation. Additionally, the team also confirmed that JA repressed the transcription of bHLH38, bHLH39, bHLH100 and bHLH101, leading to the repression of IRT1 and FRO2 expression. Consequently, the plants become more sensitive to iron deficiency under JA treatment. The proteins of bHLH18, bHLH19, bHLH20 and bHLH25 belonged to the IVa subgroup of bHLH family, shared high similarity in amino acid sequences, and possessed redundant functions. The reduced or abolished expression of the four genes in the single, double, triple and quadruple mutants resulted in sequentially enhanced accumulation of FIT protein and gradually increased tolerance to iron deficiency in JA presence. Despite forming heterodimers with FIT to activate the expression of downstream genes, the Ib subgroup bHLH proteins additionally function in FIT stability because the bHLH38-overexpressing plants accumulated more FIT than that of wild type, and exhibited stronger tolerance to -Fe+JA treatment. However, overexpression of bHLH18 in the bHLH38-overexpressing plant resulted in the disappearance of FIT over-accumulation. These results indicate that Ib subgroup and IVa subgroup bHLH proteins function antagonistically in regulating the stability of FIT. 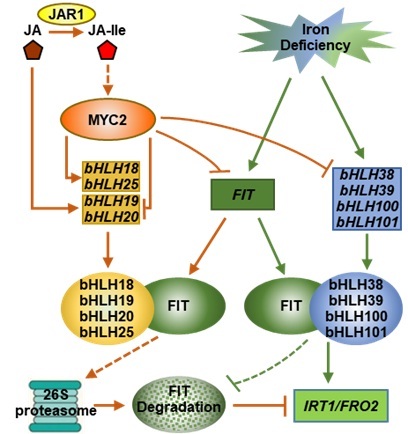 This research not only identified four novel FIT interactors, which extend the understanding of iron uptake regulation network, but also illustrated the crosstalk between iron deficiency regulation and JA signaling pathway. The paper entitled "Four IVa bHLH Transcription Factors Are Novel Interactors of FIT and Mediate JA Inhibition of Iron Uptake in Arabidopsis" was published in Molecular Plant. This work was supported by the Ministry of Agriculture of China and the National Natural Science Foundation of China.